Those in London, who want to visit Turkey or are in need of renewing their Turkish passport, can have their Turkish passport photo or visa photo taken by one of our professional photographers here at Reload Internet. You don’t need an appointment to have your photo taken, printed and cut by us, just stop by our store and a member of our experienced team will be happy to assist you. We aim to have our customer’s passport and visa photos ready within 10 minutes of their arrival here at our store in Paddington. 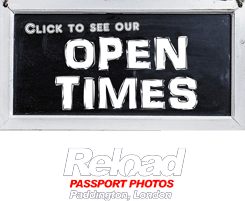 We stay open every day of the week, from early in the morning until late into the evening, making us the most convenient passport photo studio in London. Even on Sundays we close late at 8pm! 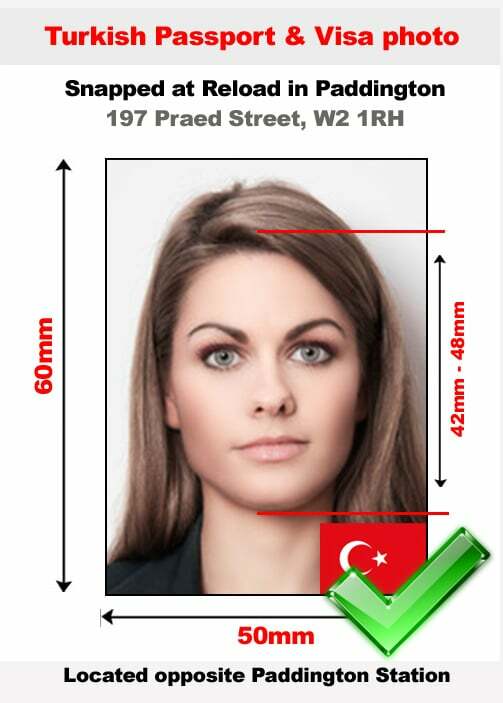 We will capture, print and cut your Turkish passport photo or visa photo to size instantly here at Reload Internet, and they will come with a guarantee to pass when you submit them with your application to the Turkish Embassy. We will provide you with a set of 4 photographs at an affordable price. If your Turkish passport photo or visa photo doesn’t meet the necessary specifications listed below, it is likely that your application will be declined. Come to Reload Internet to ensure that your Turkish passport photo or visa photo passes first time! The size must be 60mm and 50mm. One should take the picture looking straight into the camera and only the front of the face should be captured. The background should be plain and no shadows should be there. If you wear a headgear for religious purpose, that is allowed; but one should not cover his face with a mask or a hat. The photograph colour must be neutral and no blurs in the images shall be accepted. Keep your hair neat so that they don’t cover your face. Also, your expression must be neutral. Also, there should be proper light on both sides of the face so that the face in the photograph is evenly illuminated and clear. The colour photo that should be used in the Turkish passport must be printed on top quality paper. The applicant’s face must be directly facing the camera and the face and ear part should be exposed, completely. Those who are visiting Turkey for travelling or business purposes can acquire e-visas from the website of the Turkish Government online and no photos are required. Although, if you decide to go to study or work, you must carry one regular visa with a picture of 50 mm and 50 mm, with white and plain background. In the photograph, the head size of the applicant must be minimum 50%. Children and infants must have their own Turkish passport or visa. No other objects or people should be visible in the photograph. We recommend that if your child is unable to stand, they be lay down against a backdrop and the picture taken from above. Also make sure the child looks directly into the camera.. The light should reflect evenly in the photograph. Your Turkish passport photo or visa photo must meet the necessary criteria listed above, or your application may be rejected, costing you time and money. At Reload Internet, your Turkish passport photo or visa photo is guaranteed to pass with your application the first time that you submit it. Our specifications are taken from the Turkish Embassy’s official guidelines on passport and visa photos, which you can find here.